At the time that I started this quest (2003) I was decorating my personal study / man cave so I'd have a more comfortable place to work and enjoy my hobbies. One of my long time desires was to obtain the following original (aka "vintage") science fiction / science fantasy poster / art prints from the late 1970's for my collection and to frame / hang these long out of print works on the wall in the study. These are some imaginative visions from my childhood, visions which I once cherished though never actually purchased and now very much desire to own. These posters were originally sold by the Captain Company of New York, NY and could be found offered for sale in the back of Warren's "CREEPY" and "EERIE" horror magazines, as well as the other Warren publications circa 1977 to 1983 or so. I've also been told that these posters were offered for sale in both record / music stores as well as some drug stores especially out West. 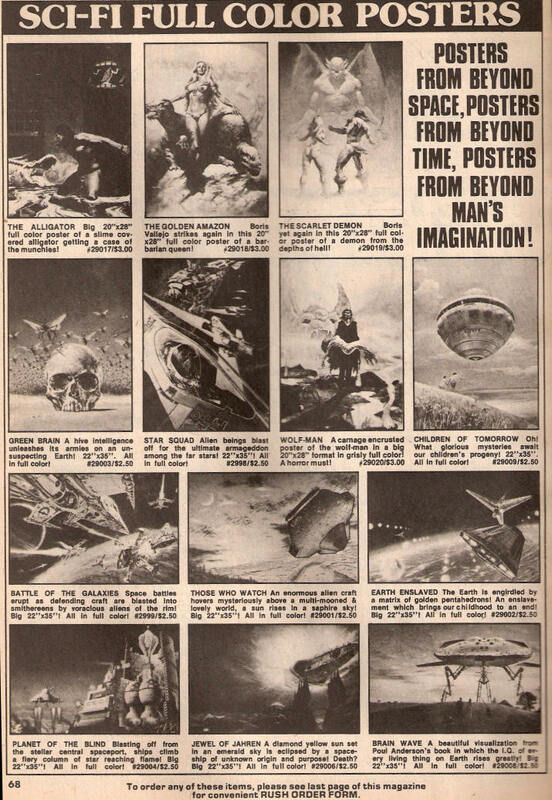 These posters were produced by the classic Paper Tiger company of the UK and were from a handful of famous sci-fi artists. 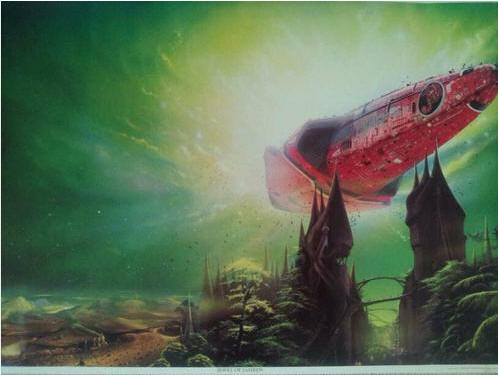 These art prints were definitely from the STAR WARS era and it was a wonderful revitalization of the sci-fi genre to be sure ... a real renaissance of sorts that occurred in the wake of the greatest science fantasy film of all time (at that time). Overall, it seemed like a fool's errand ... tracking down posters (not the most sturdy of objects ever produced by pop Western civilization culture) from over three decades before ... sci-fi artwork from the decade when disco ruled, vans were cool and Star Wars hit the silver screen like a supernova. 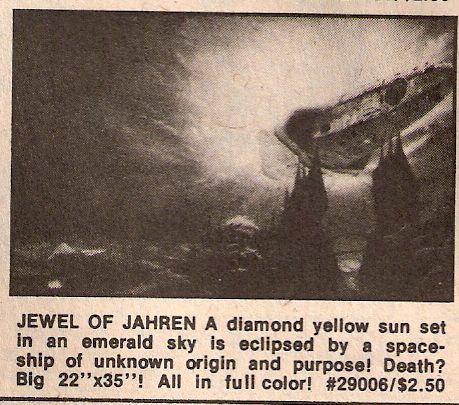 Little did I know what a grand adventure it would turn into ... a many years long (and counting) adventure / quest that put me into contact with Tim White, Bruce Pennington and Dan Goozee ... and I'm still not finished with this quest. Who knows where it will finally end or who else I'll get a chance to talk to about their work. My personal thanks go out to Tim White for his help in identifying several of these posters (including those done by his own hand) and for the time he took to answer questions and share insights into this work. I would also like to thank Mo Connolly for his help in identifying the artists for "Star Squadron" and "Battle of the Galaxies." To all the others who have emailed comments or stories about these posters and how they either remembered them from their childhood or how these posters played a part in their childhood, I thank you as well. September 2003 - While on vacation, I found one of Tim White's art books in a discount book store. 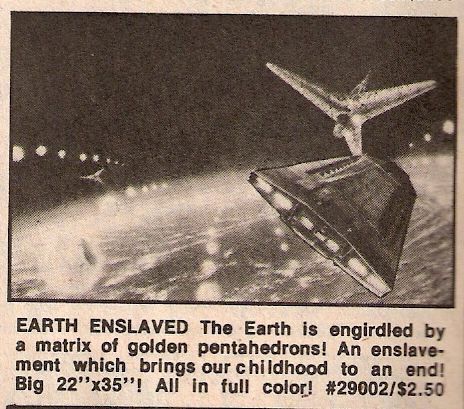 Flipping through it, I was amazed to see "Earth Enslaved", one of my favorite sci-fi posters of all time, listed as his work. At that one instant in time I was reminded of the collection of 1970's sci-fi posters that I'd wanted as a child but never got around to purchasing. That's when I got the idea to decorate my personal study in old sci-fi posters ... it seemed like a fun quest to undertake. I had no idea it would take a decade to track all of these posters down. When I returned from vacation, I looked up Tim White on the Internet, found his email address, and took a chance on contacting him. Tim was a very personable artist who took some of his busy time to talk to me at great lengths about his work and for that I am very grateful. Over the next two years, Tim White and I not only identified the artists who created these posters but solved a few mysteries about the origin of these posters as well. 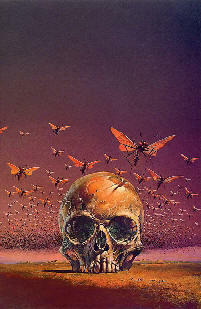 Tim also acted as a conduit for me to converse with Bruce Pennington. March 2004 - I acquire "Earth Enslaved" and "Those Who Watch" (aka "Stopwatch")" on Ebay from a dealer who, of all things, claims that these posters were originally pinned to the wall of his video arcade way back in the 1970's and that these posters were once offered as prizes to be claimed for tokens won in various games. May 2006 -Thanks go out to Mo Connolly for sharing the names of the artists for the posters I am looking for. 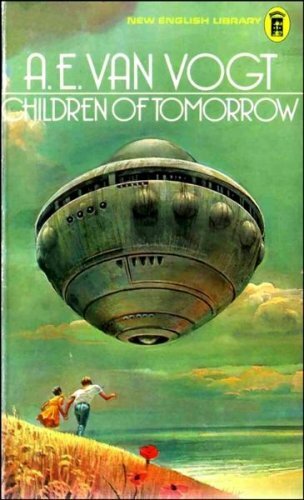 February 2007 - I found another poster from the era that I cherish, Bruce Pennington's "Children of Tomorrow" and while it wasn't on my list of "must-have" posters, it was still of the artistic quality / feel that I like and was included in the original group of posters that were sold. April 2007 - I was just looking around Ebay to waste some time and did a search on my various artists that I am looking for. Low and behold, ONE hit came up for "Gary+Meyer" and guess what it was?! 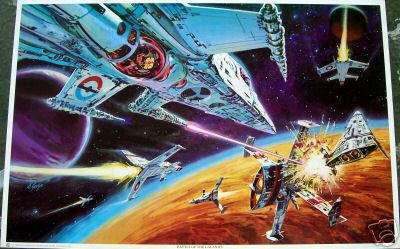 The "Star Squadron" poster! The Ebay counter says that 5 people had looked at the ad. I was the 5th person. The poster was bought "right then" with the buy it now option. You can see the poster in all its colorful glory below. 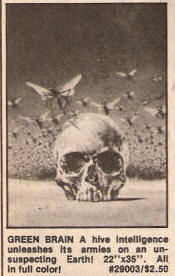 I also uploaded a scan of the original advertisement that appeared in the various Warren "Eerie" and "Creepy" magazines (as well as other Warren products like "The Rook"). Overall, I considered the "Star Squadron" poster to be the hardest poster to find when I started out this quest because I knew nothing about the artist or any of his other works and I felt that the poster was probably the least ordered of all the offerings, call it a gut feeling. Even such, four years after I started my quest, "Star Squadron" is hanging on the wall in my study. April 2008 - With a stroke of incredible luck, I secured four of these rare posters at one fell swoop on Ebay. Here is the list of the treasures that I acquired; all were in near mint condition; Tim White's "Brainwave", Dan Gozee's "Battle of the Galaxies" (Yes! 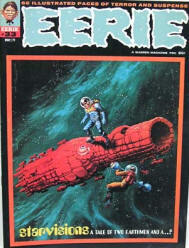 ), Dan Gozee's "Intergalactic Combat", and Dan Gozee's "Invasion". April 2012 - Four years since the last update and another stroke of luck! 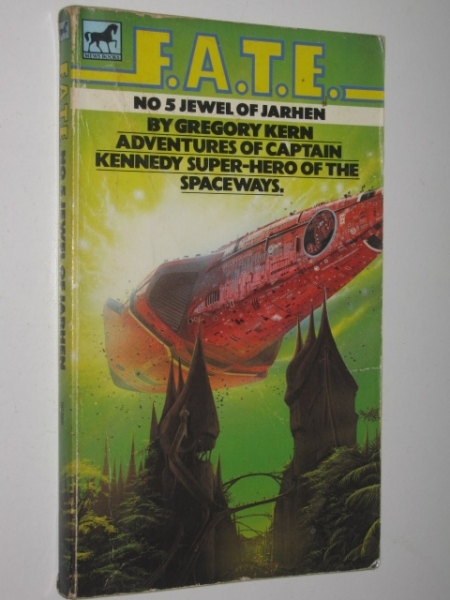 I purchased three more posters off of Ebay; Dan Gozee's "Battle of the Galaxies", Gary Meyer's "Star Squadron" and ... at long last, Tim White's "Jewel of Jahren" ! The cost? $9.97 each with free shipping. What a deal ! 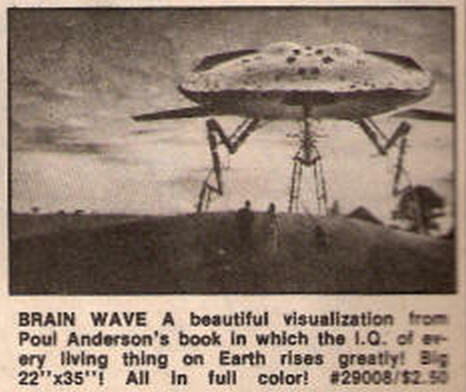 May 2013 - I acquired Bruce Pennington's "The Green Brain" on Ebay on March 15, 2013. This was the last piece of my collection and I found it on Ebay. The seller wanted $100 for it but I knew it wouldn't go for that so I waited. The auction ended and a few days later the seller relisted the poster for $60 and I knew it wouldn't go for that either. I wanted the poster but even my desire for the poster wasn't much over $30. I waited and the auction ended. A few day later the poster was relisted for $30 and I bought it. That was about $10 more than I had originally wanted to spend but since this was the last poster I went ahead and bought it thus bringing an end to a nearly decade long quest. It's been fun and I've enjoyed meeting through email some of the artists of these wonderful pieces of art. Further information on these posters and the artists who painted them? Email me ! 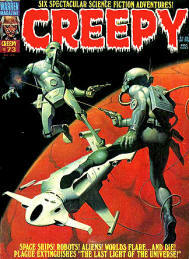 illustrated horror and science fiction magazines such as "CREEPY", "EERIE", "1994" and "THE ROOK." 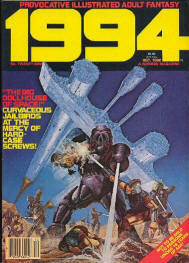 As a young child, the stories in these magazines and the images of these posters stoked my fertile imagination. 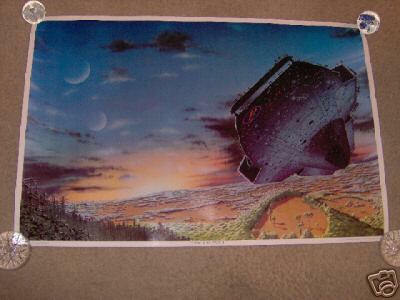 And here is a color print of the poster I purchased off of Ebay on April 10, 2008. It is so detailed, you can make out the crew in the gun turret-like blister on the attacking ship as well as smaller EVA astronauts getting caught by the explosion outside the ship being blasted. The detail is almost of Peter Elson quality. Sometime during the holiday season of 2007, I had the pleasure of talking via email to Dan Goozee about his artwork. The artist was going to have a busy schedule visiting friends and family for the holidays and our lengthy conversation was put on hold. Perhaps one day I'll contact him again and find out the background on this image. Mr. Goozee is listed as having worked as an artist at Disney World (where his title was listed as "Imagineer") so the history of this painting, coupled with his professional career story, should be an interesting tale indeed if I can ever find the time (and he can find the time as well) to converse on things of the long past. 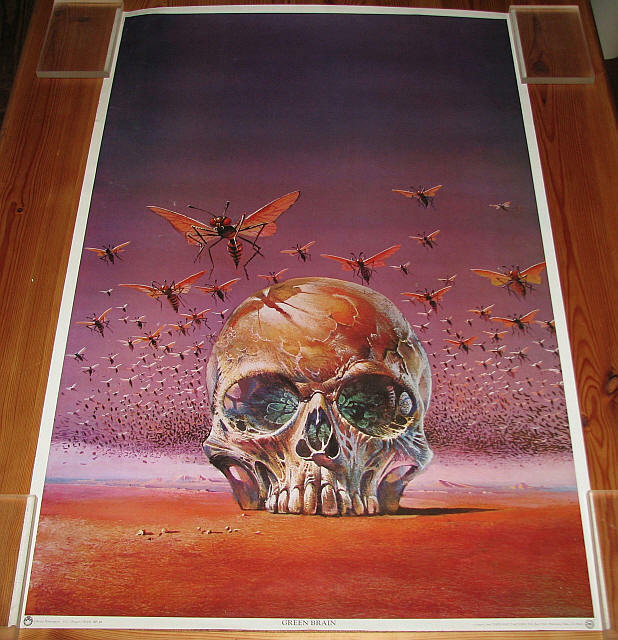 This poster is currently framed and hung in my study next to Tim White's "Earth Enslaved." 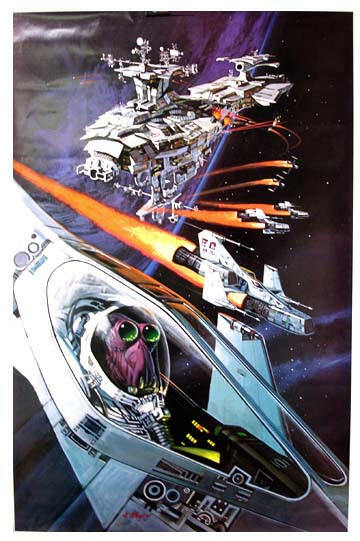 Out of all of the posters then available, I think that these two along with perhaps Gary Meyer's "Star Squadron", represent the fantastic sci-fi artwork that was being produced during the mid to late 1970's. Looking at these posters takes me back to my childhood, of a time when concerts were still cool, vinyl albums had the neatest covers and sci-fi artwork was done by hand rather than on a computer. Today's digital produced artwork lacks the soul that these artists once put into their work and it's easy to discern. Included in the auction on April 10, 2008 I also acquired two other works by Dan Goozee. These are entitled "Intercosmic Combat" and "Invasion." Perhaps, if the artist and I talk again one day, I'll be able to pass on the story of these works to you as well. 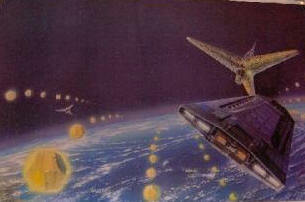 "Intercosmic Combat" has some very Battlestar Galactica (TOS) elements to it while the "Invasion" spacecraft and BEM alien seem to almost fit into the first poster's attacking spacecraft profile. Here's something I found that was interesting. This is a picture of John Dykstra, the mastermind behind the FX of "Star Wars" and "Battlestar Galactica (TOS)" and other sci-fi wonders. Here he is posing happily with his Oscar which he won in 1978 for Best Visual Effects on "Star Wars" ... notice the poster behind him on the wall? 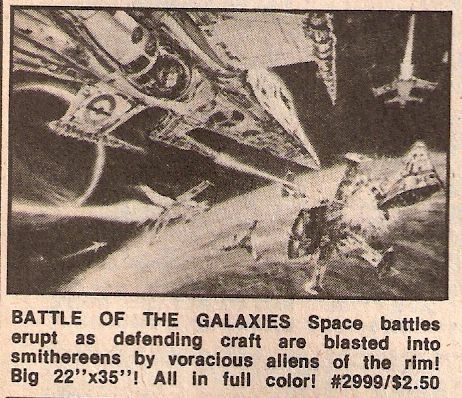 It's Dan Gozee's "Battle of the Galaxies." Some other posters by Dan Gozee. The hints to the classic TV series (1970's) "Battlestar Galactica" are obvious in Goozee's "Intercosmic Combat". 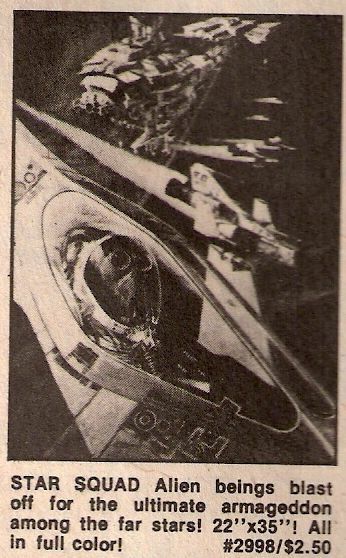 The tri-winged wedge shaped craft with their open snouts, gaping intake ports, wedge shaped canopies and red striped fuselages clearly had the BSG Colonial Vipers as influences. 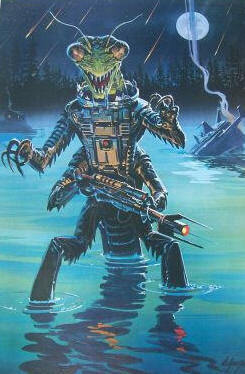 The pilot of the lead craft looks almost Simian in his features. The pilot of the attacking craft looks somewhat insectoid. 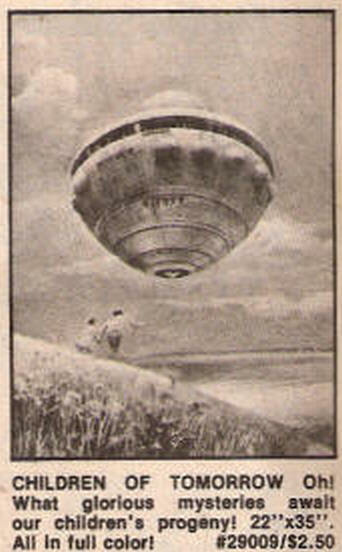 The flattened shape of the attacker with the large front canopy and dual scoops also hint to the old style BSG Cylon Raider. 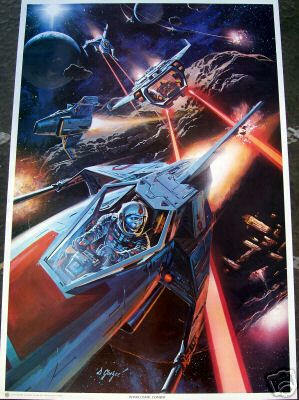 "Star Squadron" by artist Gary Meyer, circa 1977.
from the endless rolling tides of time! Gary Meyer's website features a rather impressive biography and an extensive collection of his illustrations ... some of which may be surprisingly familiar. I haven't been able to find a contact email for this artist so I have been unable to ask him the details of this particular piece of artwork. Gary's also getting old, born in 1934 he's approaching his mid '80's so I'd like to talk to him about this poster before he and any thoughts he has on this work are beyond our reach. 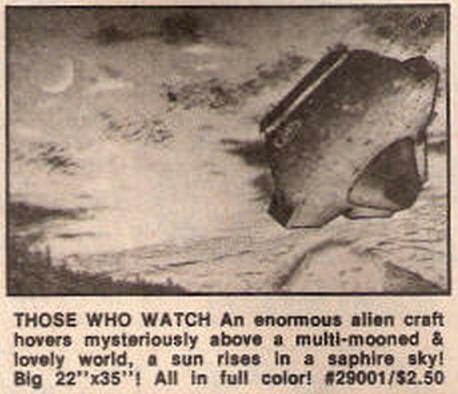 Another 35 year old sci-fi artifact rescued from oblivion. 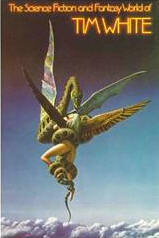 "Earth Enslaved" artwork by Tim White (UK) for the Gregory Kern novel of the same title. Rescued!!! 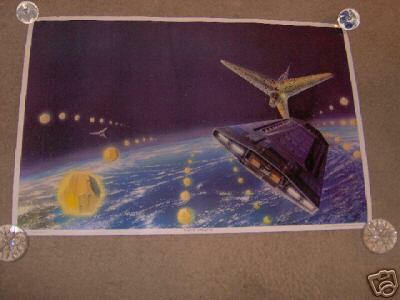 The 29 year old sci-fi art poster as it appeared for sale on Ebay. 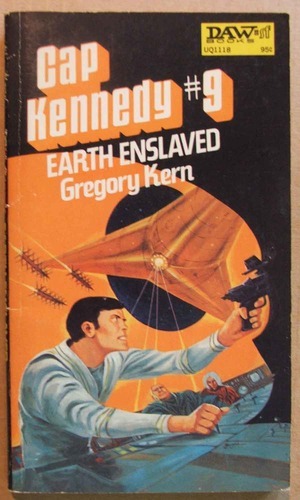 This poster was the cover of a Gregory Kern novel in the "Cap Kennedy" or "Captain Kennedy" "Hero of the Spaceways" series (kind of like the Perry Rhodan style sci-fi hero serials) entitled ... "Earth Enslaved". I've never been able to find the Tim White cover of this book but I did find one with some Jack Gauhgan artwork. Notice the similarity of the alien station? 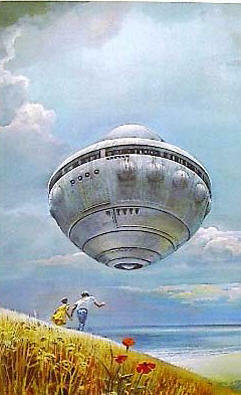 "Copyright Tim White, 1977 Dragon's World SF-6 EARTH ENSLAVED exclusively from THOUGHT FACTORY, P.O. Box 5515, Sherman Oaks, CA 91413"
Well, that's another part of the puzzle. When I last talked to Tim and brought him up to speed, he didn't remember ever selling any of his artwork in this format. Once we discovered that the artwork was apparently licensed from the Paper Tiger company, it began to make sense to Tim on how his artwork could become available in this size and market format. I also picked up this "bonus" poster from the same offerings. It is entitled "Those who watch." 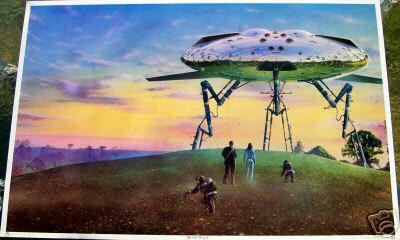 and is also by Tim White, circa 1977. 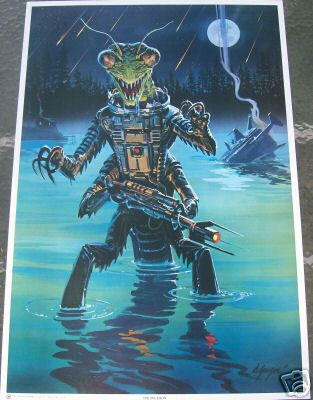 This poster features four pin holes as well and is in as good condition as the "Earth Enslaved" poster. The only difference on this poster's text, besides the title, is that it is listed as "SF-3." Tim informs me that the correct title of this work is "Stopwatch," not "Those Who Watch" as the poster is labeled. 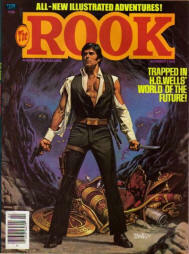 Both "Stopwatch" and "Earth Enslaved" were covers for novels published in the UK. The correct title, according to an email from the artist himself, is "Stopwatch." The poster lists the title incorrectly as well. Two 29 year old science fiction artifacts rescued from a long time ago and a generation far, far away. Part of the collection offered by The Captain Company but not one of my faves. Still, anything by Tim White is usually a good choice so up on the wall it goes. science fiction novel of the same name. I acquired this on Ebay on May 11, 2013. This was the last piece of my collection and I found it on Ebay in mid-April. The seller wanted $100 for it but I knew it wouldn't go for that so I waited. The auction ended and a few days later the seller relisted the poster for $60 and I knew it wouldn't go for that either. I wanted the poster but even my desire for the poster wasn't much over $30. I waited and the auction ended. A few days later the poster was relisted for $30 and I bought it. That was about $10 more than I had originally wanted to spend but since this was the last poster I went ahead and bought it thus bringing an end to a nearly decade long quest. It's been fun and I've enjoyed meeting through email some of the artists of these wonderful pieces of art. Not one of the posters that I was looking for but it was part of the original offering of posters by the Captain Company / Paper Tiger so I picked it up merely out of a completion impulse. For the record, I've never owned or read the Van Vogt novel but now I may simply for the cover art and the ideas that it invokes. I'm guessing that since this website has been up for the better part of a decade now that several individuals have found my site and decided to not only dig through their old poster collection but to also try to take advantage of others who are wanting these posters. The prices for these posters, especially on Ebay, have become ridiculous. If I'm to blame for that, then my apologies because such was surely not my attention. Lately I've been seeing a lot of what can only be called "price gouging" on Ebay in regard to these posters and while that isn't cool, it's the legal right of the seller to do so. The truth is that these posters are worth EXACTLY what the seller is willing to sell the poster for and what you, the buyer, are willing to pay for the poster. In capitalism, the ugly truth is that those two prices may or may not be the same ... they may not even be close! You have been warned. For example, I was first alerted to my copy of "The Green Brain" on Ebay and it was being offered for $100 which blew my mind at how fudiculous that asking price was. I waited through two no-sales and two relists of that poster before the seller brought the price down to $24.99 which I thought was within my price range, still pricey, but within my price range ... especially since I'd been looking for that poster for a decade and I was ready to close this quest out. Most other posters that I'd acquired all went for considerably less than that ... consistently. The seller, sensing my interest in these posters, sent me an email saying that he had several more of the posters in this series for sale. I offered the seller help moving his other posters in this series if he would waive the $10 shipping fee but he said that his profit margins were too close to offer free shipping (on a poster, no less) even for my return help in moving his stock (and I could have moved his entire remaining stock in a day or so). I didn't bother to tell him that we were both business owners and if he couldn't waive the shipping fee then I certainly wasn't going to send him any business. Never give away for free the only thing you have to sell. First rule of business. The second rule of business is ... you scratch my back and I'll scratch yours. That $10 would have been the best $10 that he had spent in a while. Instead, being greedy cost him far more than that $10. The point is, if you're looking for these posters then beware ... several greedy dealers are now aware that there is some interest in these posters and they're looking to make 20x to 50x or more profit on stuff that just a few months ago they were thinking about finally throwing away. If you find one of these greedy sellers, wait them out and the price should eventually come back down because if no one is paying $100 a poster for these artifacts, the price won't stay at $100 very long.